In many forms of modern contemplative practice, moderation is suggested. In the Centering Prayer movement, leaders suggest two, twenty minute sessions per day. The same recommendation seems to be present in the TM and Zen communities. The idea is to encourage regular practice, not irregular, long sessions. Some of the concern, at least from Centering Prayer teachers, is that longer sessions may lead to an overload of intense psychological material being released from the subconscious. For this reason, if a new practitioner wishes to dig deeper, many of these teachers will suggest a ten day retreat in the presence of experienced leaders, who may be able to lead someone through this experience in a safe way. It is somewhat ironic that the author of The Cloud of Unknowing shows little concern for moderation in prayer. In fact, he encourages none at all. In the following exerpt, the author encourages "the middle path" in virtually all areas of life, but in the work of contemplative love, he wishes it would never cease. "Now if you ask me what sort of moderation you should observe in the contemplative work, I will tell you: none at all. In everything else, such as eating, drinking, and sleeping, moderation is the rule. Avoid extremes of heat and cold; guard against too much and too little in reading, prayer, or social involvement. In all these things, I say again, keep to the middle path. But in love take no measure. Indeed, I wish that you had never to cease from this work of love. But as a matter of fact, you must realize that in this life it will be impossible to continue in this work with the same intensity all the time. Sickness, afflictions of body and mind, and countless other necessities of nature will often leave you indisposed and keep you from its heights. Yet, at the same time, I counsel you to remain at it always either in earnest, or, as it were, playfully. What I mean is that through desire you can remain with it even when other things intervene. For the love of God, then, avoid illness as much as possible so that you are not responsible for unnecessary infirmity. I am serious when I say that this work demands a relaxed, healthy, and vigorous disposition of both body and spirit. For the love of God, discipline yourself in body and spirit so that you preserve your health as long as you can. But if, despite your best efforts, illness overtakes you, be patient in bearing it and humbly wait for God's mercy. This is enough. Indeed, your patience in sickness and affliction may often be more pleasing to God than tender feelings of devotion in times of health." Again, the author commands his student to "beat relentlessly" on the cloud, so that he may experience the healing of God. "And so stand firmly and avoid pitfalls, keep to the path you are on. Let your longing relentlessly beat upon the cloud of unknowing that lies between you and your God. Pierce that cloud with the keen shaft of your love, spurn the thought of anything less than God, and do not give up this work for anything. For the contemplative work of love by itself will eventually heal you of all the roots of sin. Fast as much as you like, watch far into the night, rise long before dawn, discipline your body, and if it were permitted – which it is not – put out your eyes, tear out your tongue, plug up your ears and nose, and cut off your limbs; yes, chastise your body with every discipline and you would still gain nothing. The desire and tendency toward sin would remain in your heart. What is more, if you wept in constant sorrow for your sins and Christ's Passion and pondered unceasingly on the joys of heaven, do you think it would do you any good? Much good, I am sure. You would profit no doubt and grow in grace, but in comparison with the blind stirring of love, all this is very little. For the contemplative work of love is the best part, belonging to Mary. It is perfectly complete by itself while all these disciplines and exercises are of little value without it. The work of love not only heals the roots of sin, but nurtures practical goodness. When it is authentic you will be sensitive to every need and respond with generosity unspoiled by selfish intent. Anything you attempt to do without this love will certainly be imperfect, for it is sure to be marred by ulterior motives. Genuine goodness is a matter of habitually acting and responding appropriately to each situation, as it arises, move always my the desire to please God." In this excerpt, the spiritual director uses the image of being wood to a carpenter. The idea is that the practitioner of Centering Prayer is passive. The goal is not to "do something," but to let something be done in you. To let that mysterious grace move. I come back to this image often. "...become increasingly faithful to this work until it becomes your whole life. To put it more simply, let that mysterious grace move in your spirit as it will and follow it wherever it leads you. Let it be the active doer and you the passive receiver. Do not meddle with it (as if you could possibly improve on grace), but let it be for fear you spoil it entirely. Your part is to be as wood to a carpenter or a home to a dweller. Remain blind during this time cutting away all desire to know, for knowledge is a hindrance here. Be content to feel this mysterious grace sweetly awaken in the depths of your spirit. Forget everything but God and fix on him your naked desire, your longing stripped of all self-interest." In this excerpt, the author of The Cloud of Unknowing instructs the practitioner that he must put a cloud of forgetting between himself and all created things. That is to say, during this type of prayer, no thought is welcomed or indulged. The author is describing apophatic prayer – what is sometimes conceptualized as "resting in God." "If you wish to enter into this cloud, to be at home in it, and to take up the contemplative work of love as I urge you to, there is something else you must do. Just as the cloud of unknowing lies above you, between you and your God, so you must fashion a cloud of forgetting beneath you, between you and every created thing. The cloud of unknowing will perhaps leave you with the feeling that you are far from God. But no, if it is authentic, only the absence of a cloud of forgetting keeps you from him now. Every time I say "all creatures," I refer not only to every created thing but also to all their circumstances and activities. I make no exception. You are to concern yourself with no creature whether material or spiritual nor with their situation and doings whether good or ill. To put it briefly, during this work you must abandon them all beneath the cloud of forgetting. For although at certain times and in certain circumstances it is necessary and useful to dwell on the particular situation and activity of people and things, during this work it is almost useless. Thinking and remembering are forms of spiritual understanding in which the eye of the spirit is opened and closed upon things as the eye of a marksman is on his target. But I tell you that everything you dwell upon during this work becomes an obstacle to union with God. For if your mind is cluttered with these concerns there is no room for him. Yes, and with all due reverence, I go so far as to say that it is equally useless to think you can nourish your contemplative work by considering God's attributes, his kindness or his dignity; or by thinking about our Lady, the angels, or the saints; or about the joys of heaven, wonderful as these will be. I believe that this kind of activity is no longer any use to you. Of course, it is laudable to reflect upon God's kindness and to love and praise him for it; yet it is far better to let your mind rest in the awareness of him in his naked existence and to love and praise him for what he is in himself." 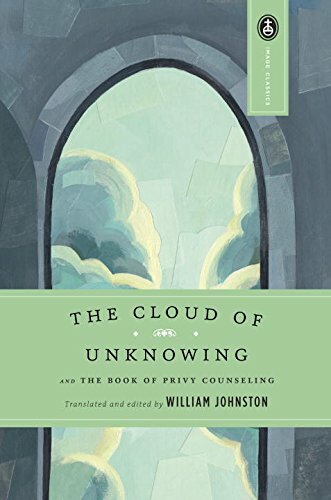 The Cloud of Unknowing is an anonymous work, written by a spiritual director from the Catholic contemplative tradition in the 14th Century. In it, the author describes a type of prayer in which one strives to reject all thought, hoping to experience and be healed by God in stillness of mind. The author calls this state, one in which all thoughts are rejected and the mind is stilled, the cloud of unknowing. He believes that encountering God in this way is the way to a changed spirit and character, and, ultimately, to union with God. The modern Centering Prayer movement is based on the method of prayer found in this book. "This is what you are to do: lift your heart up to the Lord, with a gentle stirring of love desiring him for his own sake and not for his gifts. Center all your attention and desire on him and let this be the sole concern of your mind and heart. Do all in your power to forget everything else, keeping your thoughts and desires free from involvement with any of God's creatures or their affairs whether in general or particular. Perhaps this will seem like an irresponsible attitude, but I tell you, let them all be; pay no attention to them. What I am describing here is the contemplative work of the spirit. It is this which gives God the greatest delight. For when you fix your love on him, forgetting all else, the saints and angels rejoice and hasten to assist you in every way – though the devils will rage and ceaselessly conspire to thwart you. Your fellow men are marvelously enriched by this work of yours, even if you may not fully understand how; the souls in purgatory are touched, for their suffering is eased by the effects of this work; and, of course, your own spirit is purified and strengthened by this contemplative work more than by all others put together. Yet for all of this, when God's grace arouses you to enthusiasm, it becomes the lightest sort of work there is and the one most willingly done. Without his grace, however, it is very difficult and almost, I should say, quite beyond you. And so diligently persevere until you feel the joy in it. For in the beginning it is usual to feel nothing but a kind of darkness about your mind, or as it were, a cloud of unknowing. You will seem to know nothing and to feel nothing except a naked intent toward God in the depths of your being. Try as you might, this darkness and this cloud will remain between you and your God. You will feel frustrated, for your mind will be unable to grasp him, and your heart will not relish the delight of his love. But learn to be at home in this darkness. Return to it as often as you can, letting your spirit cry out to him who you love. For if, in this life, you hope to feel and see God as he is in himself it must be within this darkness and this cloud. But if you strive to fix your love on him forgetting all else, which is the work of contemplation I have urged you to begin, I am confident that God in his goodness will bring you to a deep experience of himself."